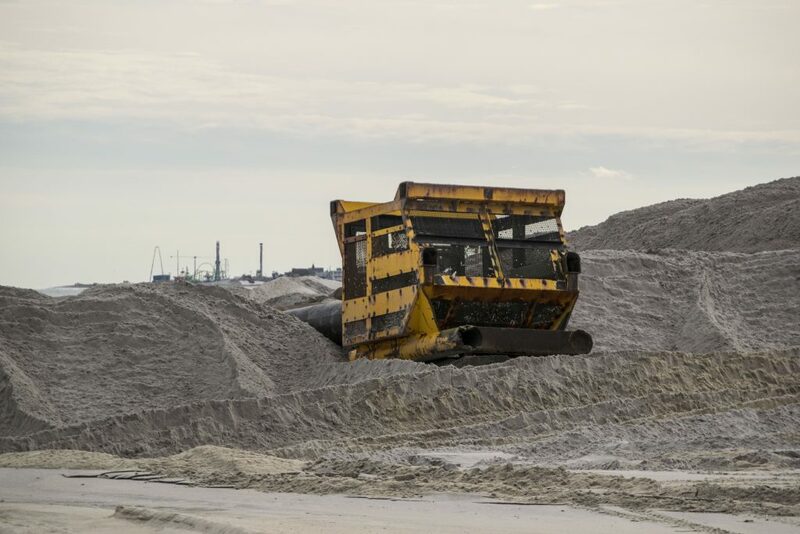 Toms River’s North Beaches may not have received the same recognition for their struggles after Superstorm Sandy as neighboring Ortley Beach, but replenishment work has begun in the tightly-woven bungalow communities that dot the northern edge of the township. Work in Ocean Beach, Chadwick Beach and adjacent neighborhoods began in earnest this week, with crews already having pumped blocks’ worth of sand ashore. What will ultimately be the new dune line in the group of private communities – some which still can only be accessed by dirt roads – is taking shape in front of the small boardwalk that has been the summer home of thousands of beach lovers for generations. “I wanted to come see some action,” one 50-year resident of the neighborhood said, standing on the beach entrance near Kingfisher Way as the engines of the hopper dredge Magdalen roared to life after connecting to an offshore pipe. Within minutes, water started blasting out of the pipeline and into a filter system before landing on the beach. A few minutes after that, the 60-40 percent mix of sand and water turned a deeper shade as sand collected from the bottom of the ocean made its way to shore. 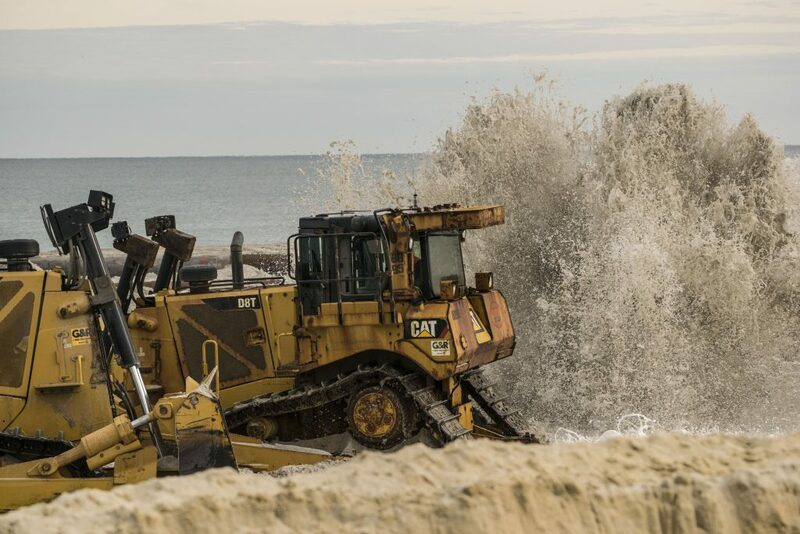 After each load of sand is pumped through the network of pipes to the beachfront, crews are on hand to move the sand in order to build a 22 foot-high dune and increase the size of the beach to more than 200 feet. 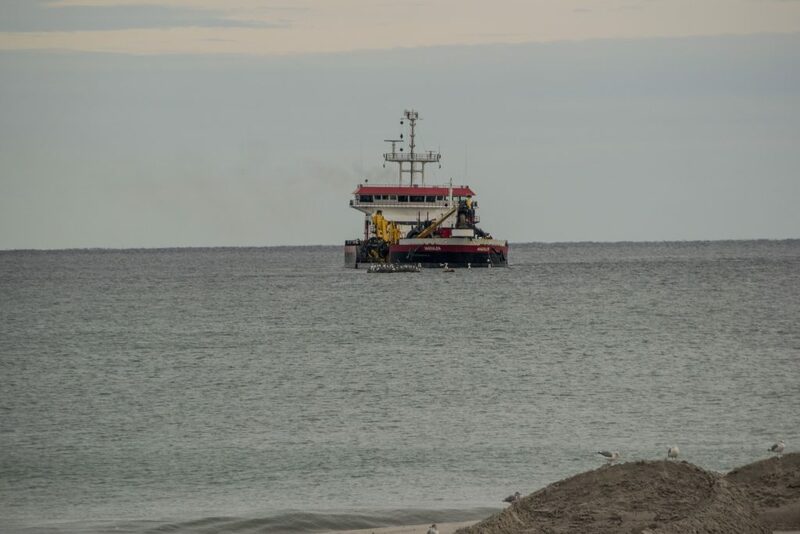 The first round of replenishment in the North Beaches has led to the closure of beach entrances at E. Pompano Way, E. Sandpiper Way, E. Marlin Way, E Pelican Way, E Dolphin Way, E Flamingo Way, E Tarpon Way and E Kingfisher Way. Construction is estimated to last through mid-January 2019, according to the U.S. Army Corps of Engineers. The pipe landing was made between East Pompano Way and East Sandpiper Way. Work will first proceed north toward Normandy Beach, then flip and pump south.